Middlesbrough might have lost its Pure Party store in the fallout from Clinton Cards’ collapse, but as some retailers depart the town others are arriving – or expanding. Just now, it seems that the once thing the town can’t get enough of is discount variety stores. In March, 99p Stores opened only its second store in the North East, knocking together several units in the Cleveland Centre (ex-Mall Middlesbrough) to create a large new shop in the previously rather empty Newton Mall. Before that, Poundland moved to larger premises in Captain Cook Square in February last year, taking over the ex-Zavvi unit, closely followed by the opening of the Poundworld-owned Discount UK in Hillstreet’s former Woolworths premises. Today (8 June), these have how been joined by a new eponymous Poundworld store, which has taken over the Captain Cook Square site that Peacocks vacated just a few months ago, adjacent to the recently opened Metro Outlet (ex-TJ Hughes). 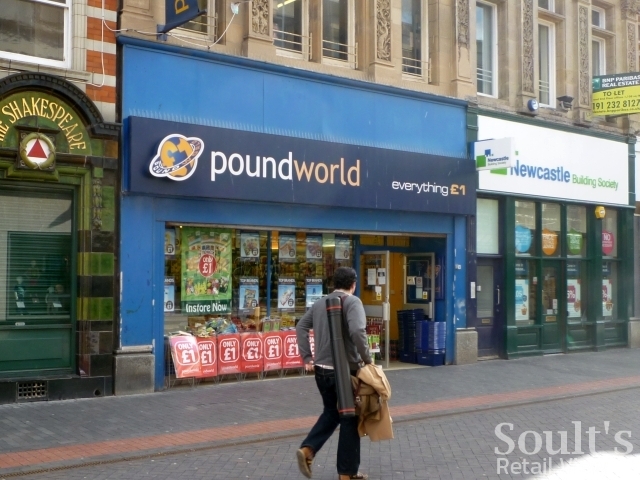 According to Poundworld, the store opening – which supplements, rather than replaces, the existing, smaller store in Linthorpe Road – has created 30 new retail jobs. The opening continues a remarkable period of expansion for Poundworld’s fascias, both in the North East and elsewhere in the UK. 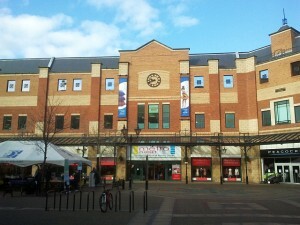 The new Middlesbrough store is apparently the chain’s 162nd store, while Swindon – which only opened on 24 February – was the 133rd. 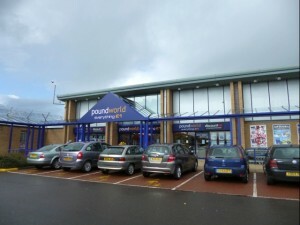 This means that Poundworld has seemingly opened 30 new UK stores in the last 15 weeks – really quite an astonishing rate of growth – many of them in former Peacocks locations. Here in the North East, as well as the aforementioned Middlesbrough Discount UK that opened 14 months ago, Newcastle welcomed the company’s multi-price format to its ex-Woolworths site back in November last year. 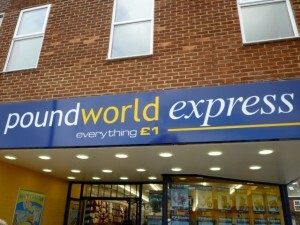 Since then, the region seems to have been a bit of a test bed for other variations on the Poundworld format. 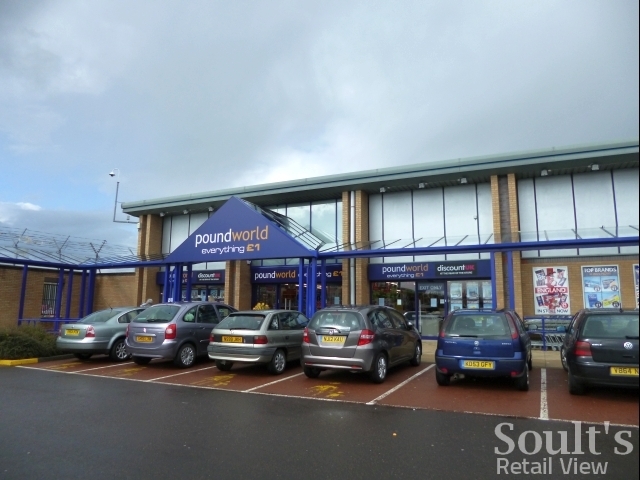 Recent openings have included dual-fascia (Poundworld and Discount UK) retail-park stores at Cramlington’s Manor Walks and Sunderland’s Hylton Retail Park, both in April, as well as a traditional Poundworld store – the first in Durham – on Dragonville Retail Park just a week ago. 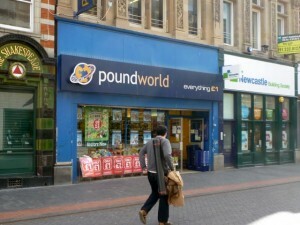 The move towards co-locating Discount UK alongside Poundworld appeared to raise questions over the future of Discount UK as a standalone format, though Poundworld denied that there were any plans to phase it out. The latest Middlesbrough opening, however, seems to confirm that the company is committed to Discount UK; otherwise, it would surely just have converted the existing Hillstreet store over, rather than opening a large new Poundworld not very far away. In March, the North East also saw only the third opening of Poundworld’s compact Express format, in Redcar, which I was able to visit a few days after opening. Though very small at 1,400 sq ft, and with just two aisles up and down, the store seemed to be doing well – it was very busy, but still tidy and well organised, with plenty of useful stuff and about a third of its space devoted to drinks, snacks and groceries. As yet, however, no more Express stores have opened or are planned – seemingly the consequence of too many timely opportunities to grab new space elsewhere, rather than any abandonment of the compact format. 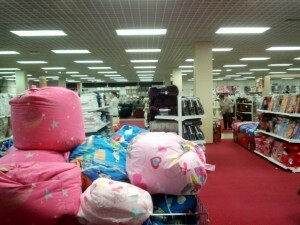 Knowing the popularity of my previous blogs about store interiors – such as Gateshead’s ex-Netto Asda or Newcastle’s Clas Ohlson – I had, incidentally, asked Poundworld head office whether I could take some interior shots of the Redcar Express store. Unfortunately, the apologetic PR people came back with the response that Poundworld “does not allow interior media shots of the stores to be taken unless these are internally carried out”, which seems a bit of a pity, particularly given the paucity of ‘official’ shots. 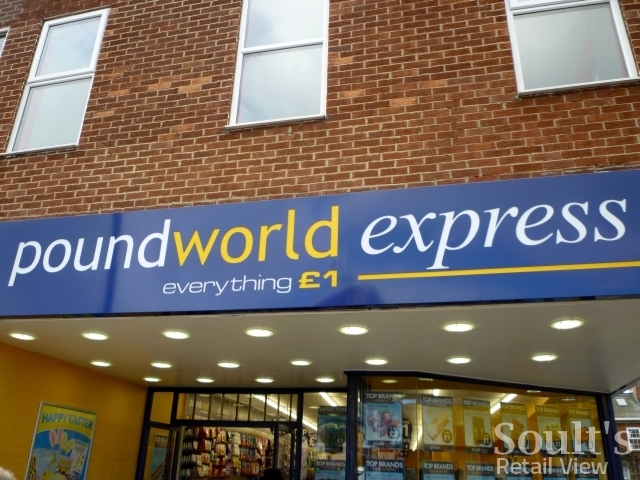 For a value retailer, Poundworld’s store interiors are generally excellent – clean, bright, well stocked, and with very clear instore signage – so, unlike one or two value competitors that shall remain nameless, there’s certainly nothing to hide. 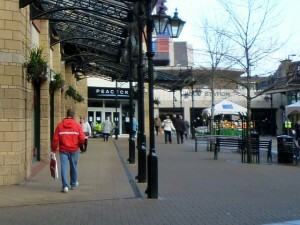 For Middlesbrough, meanwhile, today’s opening is a welcome vote of confidence in the town centre. As one of Middlesbrough’s newest and most appealing shopping centres, with a good location close to Linthorpe Road (the main pedestrianised street) and the bus station, Captain Cook Square has traditionally had a very high occupancy rate. It was rather nobbled, however, by a pair of national retail collapses that had little or nothing to do with Middlesbrough specifically: first the loss of its anchor store, TJ Hughes, in August last year, and then the closure of what was admittedly an overly large and prominent Peacocks – rather like Newcastle’s, an ultimately ill-advised foray into flagship locations. With both now reoccupied, however, Middlesbrough is in a much better position than many of the towns and cities that I’ve visited over the last few months. Though I haven’t seen any recent numbers, my impression is that relatively few of TJ Hughes’ large sites have found new occupants yet, with Sunderland, St Helens and Preston all among the empty sites that I’ve recently encountered. 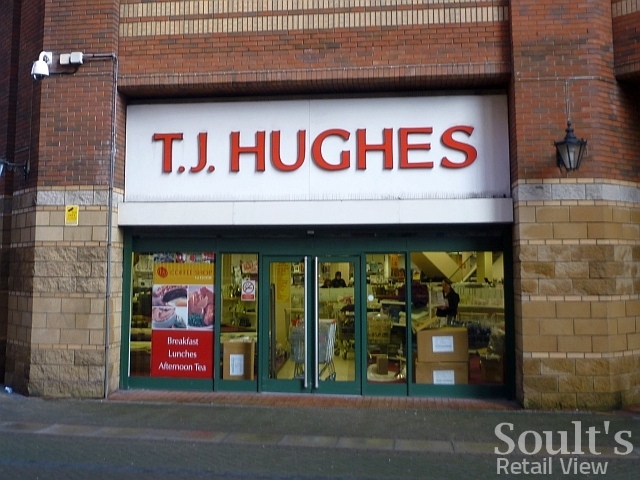 Poundland, for example, has snapped up a few ex-TJ’s locations, while Debenhams and Beales (for an outlet store) have taken over the sites in Dumfries and Maidstone respectively. Unsurprisingly, however, there are relatively few retailers with current requirements for stores of this size: either the space is too big, or the likely candidates are represented already. When I visited three months ago, Middlesbrough’s Metro Outlet seemed to be a bit of a work in progress: confusingly, there was still a TJ Hughes sign around the back, while the inside needed a good vacuuming throughout and a bit of order and structure for the fashion section at the front of the store. Hopefully, as with the original Metrocentre outlet, the store will have settled down and improved with time, as the quality and variety of its furniture and homewares offer does seem very good. 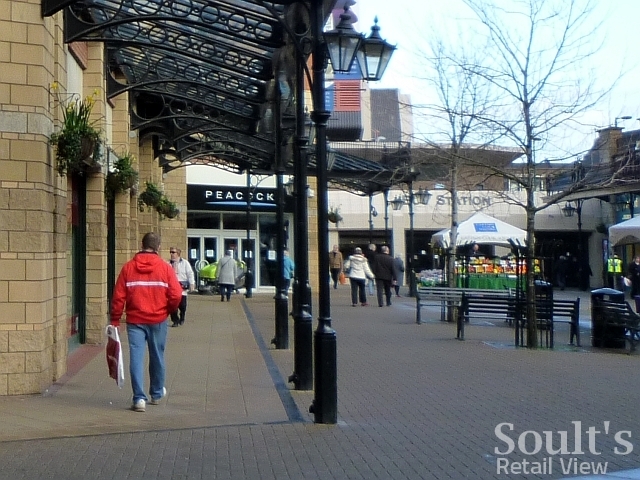 For the moment, however, Middlesbrough should be pleased that retailers are still investing in its town centre: creating jobs, driving footfall, and – perhaps most importantly of all – averting the scourge of the empty shop.